We can't currently survey flight prices for August 2019 as they aren't available yet. We will aim to survey flight prices closer to the travel dates. August is not only Women's month, it also marks the official end of winter. Fingers crossed that Cape Town's dams will inch closer to 70% full during the next 30 days! The 9th of August 2018, Women's Day, is a public holiday. Many South-Africans seem to have taken leave on the Friday to create a long-weekend, as flight prices are slightly more expensive around these dates. Budget-conscious travellers should try to avoid flying on the 8th, 9th and 12th of August 2018 where possible. More affordable flights can be found towards the end of the month, when the weather could start warming up. So it is a win-win all around! Consult our calendar below to find the cheapest travel dates on your desired route. Kulula OR Tambo to Cape Town : Flights become more affordable from the 13th onwards. Kulula Cape Town to OR Tambo : Tuesday to Thursday flights are the most affordable this month, particularly towards the end of August. Kulula Lanseria to Cape Town : Avoid travelling during the first two weeks of the month where possible if you're on a budget. Kulula Cape Town to Lanseria : If you're flexible try to fly on a Thursday or Friday when flights are considerably more affordable and avoid Sunday flights where possible. Kulula Lanseria to Durban : Budget-conscious travellers should try to avoid travelling on the 8th and 9th where possible. Kulula Durban to Lanseria : Affordable flights can be found throughout the month. Kulula Johannesburg to George : Weekend flights are surprisingly affordable on this route, with the exception of Saturday the 4th which is actually one of the most expensive travel dates. 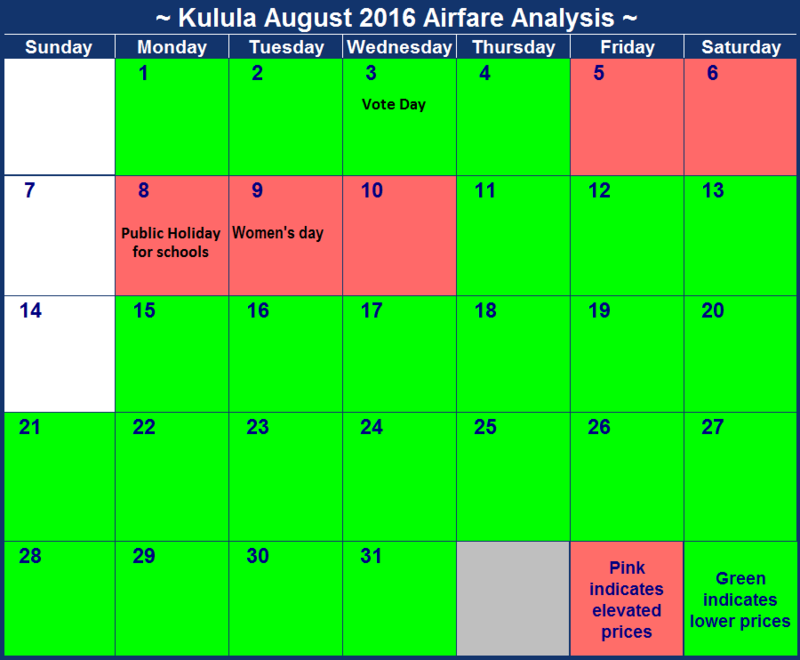 Kulula George to Johannesburg : Avoid travelling on dates highlighted in pink of you are on a tight budget, rather look at Fridays and Saturdays. Kulula Cape Town to Durban : If you are travelling on a tight budget we'd suggest flying on the 28th or 29th when flights are cheapest. Kulula Durban to Cape Town : Cheap flights are readily available towards the end of the month. Kulula Johannesburg to East london : Sunday to Thursday are the most affordable days of the week to travel on. Kulula East London to Johannesburg : Budget-conscious travellers should avoid the 12th where possible as a flight costs about four times the price of a flight on any other day. August is Women's month, with National Women's Day taking place on the 9th. As this falls on a Wednesday, flight prices are only slighly elevated on that date. The knock-on effect of this is however that flights on the following Sunday are way more expensive than usual. Sunday flights are typically some of the most expensive on most routes, as everyone that went away for the weekend usually returns on the Sunday. So it seems more people are taking a break and possibly making an extra long weekend out of this. Cheap flights are actually readily available on most routes, with airfares remaining fairly consistent throughout the month with the exception of the above. Look out for dates highlighted in green below! Kulula OR Tambo to Cape Town : Where possible, avoid travelling on the 4th and the 5th of August. Kulula Cape Town to OR Tambo : Avoid travelling on Sundays, as prices are slightly elevated - especially on the 13th. Kulula Lanseria to Cape Town : Flights are incredibly consistent and affordable throughout the month. Kulula Cape Town to Lanseria : Similar to the Lanseria to Cape Town route, flight prices have remained the same on each day of the month. Kulula Lanseria to Durban : Flights are affordable throughout the month, with prices slightly elevated on Fridays. Kulula Durban to Lanseria : Affordable flights can be found throughout the month. The price is elevated on the 13th. Kulula Johannesburg to George : Prices are stable thoughout the month, with a slight increase on the 9th. Kulula George to Johannesburg : Prices are stable thoughout the month, with a big increase on the 13th. Kulula Cape Town to Durban : The cheapest flights are on the 15, 22nd, 23rd, 24th, 29th and the 30th. Kulula Durban to Cape Town : Affordable flights can be found dotted all over the month, especially on the 1st, 15th, 16th, 22nd, 23rd, 26th, 28th, 29th and the 30th. Kulula Johannesburg to East london : Sunday to Thursday flights are more affordable than flights during the rest of the week. Kulula East London to Johannesburg : Avoid travelling on Sundays as those are the most expensive dates throughout the month. 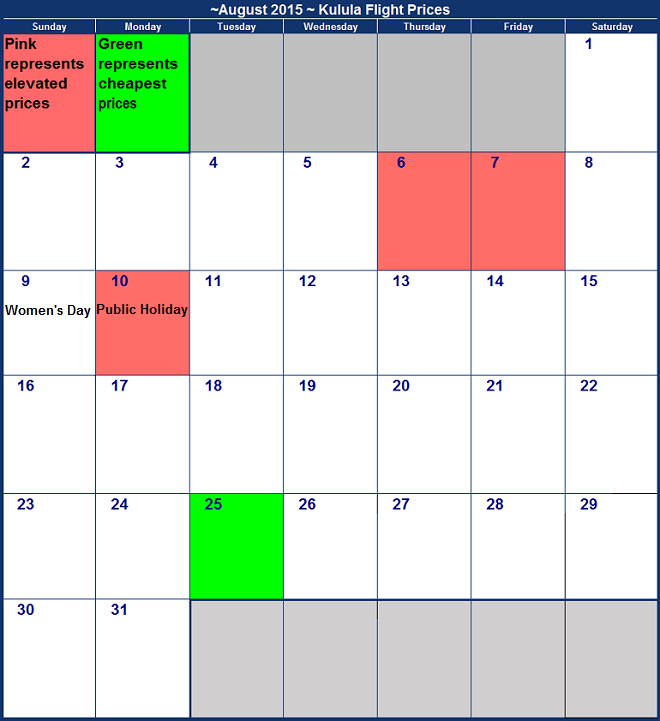 This year August sees more public holidays than most months, with two public holidays plus a third school holiday! On the 3rd of August voters across the country will take to the polls to vote in the local election. Although this is a public holiday, it makes sense for most to stay home and vote in their district where they have registered. The following Tuesday, the 9th, is Women's Day and obviously many people will choose to make that a long weekend- especially those with children. After the 9th of August 2016 things are returning to normal with affordable flights available on most routes. Kulula OR Tambo to Cape Town : Where possible, avoid travelling on the 4th and the 5th of August where possible. Kulula Cape Town to OR Tambo : As the long weekend draws to a close for many around the 8th and the 9th, flight prices are incredibly inflated around those dates. Kulula Lanseria to Cape Town : Mid-week flights are affordable throughout the month, with slight increases on Fridays and Sundays. Kulula Cape Town to Lanseria : Avoid travelling on the 8th and 9th as flight prices are elevated around the public holiday. Kulula Lanseria to Durban : Avoid travelling after the public holiday on the 3rd as those flights are incredibly elevated. Kulula Johannesburg to George : Avoid travelling on Saturday the 6th where possible. Kulula George to Johannesburg : Avoid travelling on Women's Day and rather try the rest of the month, when flight prices are more stable. Kulula Cape Town to Durban : Avoid travelling on the 6th and 21st, when flight prices are higher than during the rest of the month. Kulula Durban to Cape Town : Affordable flights can be found dotted all over the month. Kulula Johannesburg to East london : Sunday to Wednesday flights are more affordable than flights during the rest of the week. Kulula East London to Johannesburg :Pick and choose your flight dates according to your own will, affordable flights are easily had this month. Women's Day falls on a Sunday this year, causing the Monday to also be a public holiday. Consequently the weekend of the 8th of August is a long one. Flight prices are slightly elevated on the 6th, 7th and 10th of August 2015. Looking for the cheapest flight this month? You should really consider the 25th as this is the cheapest date to travel on most routes this month. This survey was last updated on the 30th of June 2015. The more time that has passed since, the likelier that prices may have changed. Kulula OR Tambo to Cape Town : As you can see the flight prices are elevated around the 6th and 7th of August. You might benefit from starting your long weekend a day later. Kulula Cape Town to OR Tambo : Try to avoid travelling on the 10th of August if possible. Kulula Lanseria to Cape Town : Prices are relatively consistent throughout the month. Try to avoid travelling on the 6th and 7th of August. 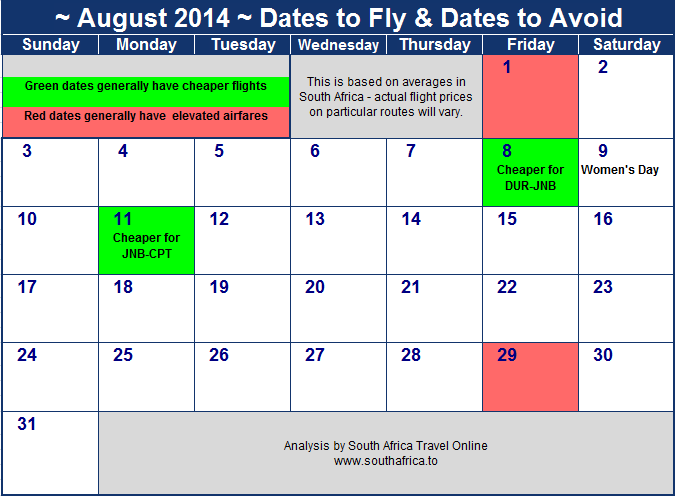 Kulula Cape Town to Lanseria : Once again the 25th is the cheapest date of the month to travel on. Kulula Lanseria to Durban : Travelling to the sunny coast for the long weekend isn't much more expensive than the rest of the month. Kulula Durban to Lanseria : It is interesting to note that the long weekend doesn't seem to have an influence on these prices at all. Kulula Johannesburg to George : On the 6th and the 7th prices are more than double compared to the rest of the month. Kulula George to Johannesburg : Coincidentally the 7th is the cheapest date to travel on this route! 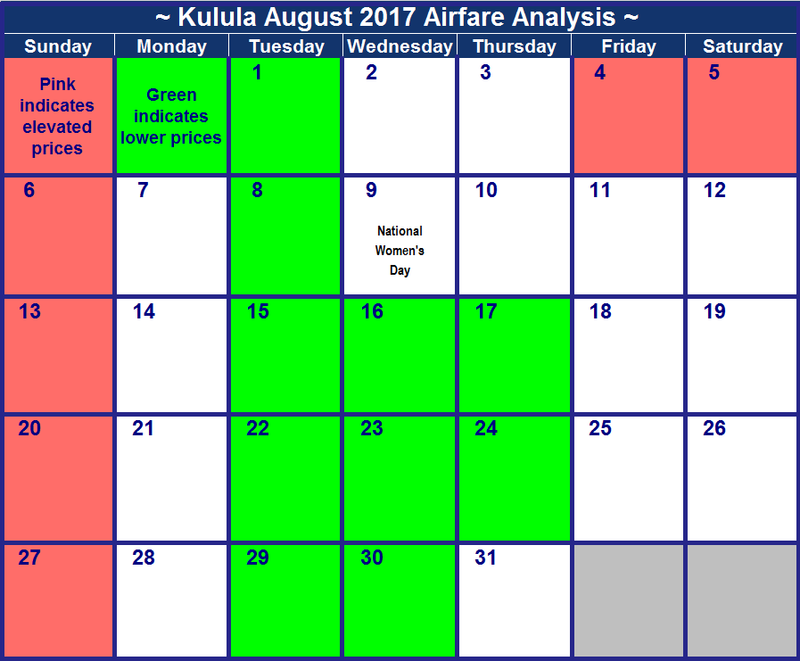 Kulula Cape Town to Durban : Prices are much more expensive on the 6th, 7th, 8th, 9th and 10th than during the rest of the month. Kulula Durban to Cape Town : Flights are slightly more expensive on the 7th and the 8th than the rest of the month. Kulula Johannesburg to East london : If you can, rather start your long weekend a day later to save on travel costs. Kulula East London to Johannesburg : Flights are around R300 more expensive on the 10th than the day before. August 2014 is one of those painful months where the only public holiday falls on a Saturday (Women's Day is on the 9th), and so there are no days off work. There are also no school holidays, so it should theoretically be one of the cheaper months in which to fly, and one in which airfares are more even over the month. There'll probably just be the usual element of airfares being elevated on Fridays and Sundays as weekend holidaymakers leave and return. This survey was conducted on the 17th March 2014. The longer it is since the survey was conducted, the greater the probability that airfares will have changed from the below. Check current airfares at Kulula, and keep an eye out for cheap flights on our Kulula specials page. Kulula OR Tambo to Cape Town : As you can see the flight prices are exactly the same on every day of the month, except the 11th when it's a bit cheaper. Kulula Cape Town to OR Tambo : And for CPT to JNB flights, airfares are exactly the same on every day of the month. Kulula Lanseria to Cape Town : Try not to fly on Saturday the 30th of August. Kulula Lanseria to Durban : Prices are elevated on the 1st, 8th and the 29th of August. Kulula Durban to OR Tambo: It's interesting to see that for some unknown reason flight prices are considerably cheaper on the 8th of August. Kulula Lanseria to Durban : Try avoid flying on Fridays, as airfares are elevated. Click here to see Kulula's August 2013 airfares. Click here to see Kulula's August 2010 flight prices.